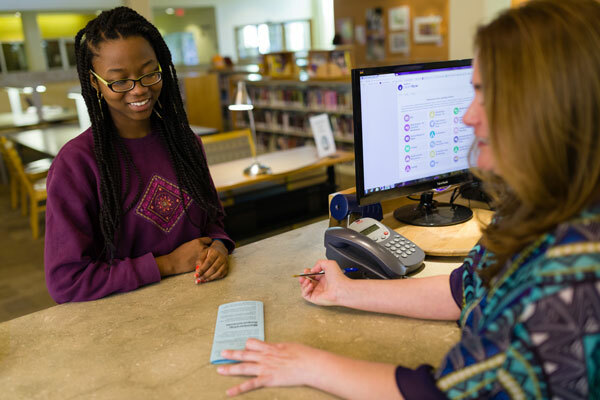 Library card applications are taken at the Circulation Desk on the first floor of the library. If you have a Florida driver’s license in good standing with a Florida address AND a clear account with other county libraries, you may get a card with us free of charge. A current Florida driver’s license is the only single piece of identification that will serve to qualify for a card. If you do not have a Florida driver’s license, you may still get a free card if you can supply us with proof of residence in Delray Beach and a photo ID; i.e. legitimate driver’s license from any state. A Florida ID may also serve as a photo ID. For applicants without Florida driver’s license, proof of residence is best demonstrated by showing us an original lease agreement OR something official with your name and Delray Beach address on it (a bill, credit card statement, or an official piece of mail). If you are a temporary resident, you may still get a library card for a charge of $60.00 annually (or $15 per quarter). If you are 14 years of age or younger, a parent or guardian must apply for your card.